High performance yagi antennas designed by Ljubisa Popa, YU7EF, optimized for a low noise figure. These antennas are well known among EME enthusiasts. VE7BQH lists the G/T Values of many yagi antennas, where the YU7EF design ranks very favorably. But unfortunately you had to build these antennas on your own - until now. We will implement the antenna designs one by one, beginning with the most popular antennas. The antennas use folded dipoles with N female socket, the elements are mounted on top of the boom. With the 70cm antennas the mast clamps are located below the boom, so they do not interfere with the element structure and have no influence on the radiation pattern. The elements of the 2m yagis are made from 8mm aluminium tubing, for the 70cm antennas we use 6mm solid aluminium rods. All support struts are V-shaped, resulting in maximal efficiency, even better than a double boom. For easier transport the struts are split in two parts. Support struts may be mounted above of the antenna as well, which makes the construction of yagi arrays much simpler. 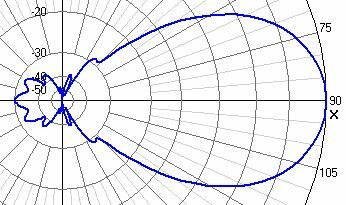 Special dipoles with 180° phase shift are not required. The mounting hardware for the struts are made from laser-cut, stainless steel sheet metal. These brackets can also be used as anchors for guy wires above the antenna, in case the strut is too heavy or impossible to use. What is a 'G/T optimized' Yagi? All bodies warmer than the absolute zero point (-273° C or 0 Kelvin) produce some noise. This noise originates for example from the warm earth soil. Other, more or less wide band noise sources are the 'usual suspects' like electronic devices or ionisation on insulators of high tension power lines. 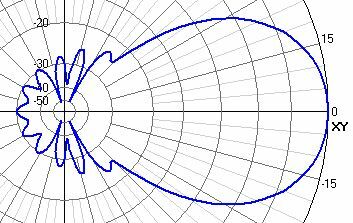 This parasitic noise is caught by the antenna just as the wanted signal, and results in a degradation of sensitivity. This happens for example when the antenna is pointed skywards (EME!) and the back of the antenna, with all it's side lobes, points towards the earth. 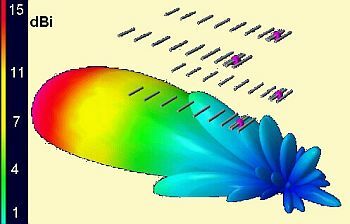 The ratio from forward gain and the noise figure resulting from the side lobes of the antenna is called G/T (Gain/Temperature) and is a good measure for the quality of an antenna. There are two basic methods to achieve a good G/T ratio: either optimize for maximum gain, with still acceptable side lobes, or reduce side lobes as much as possible and accept a lower gain. 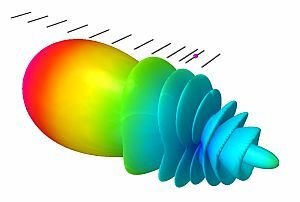 So, for EME the antenna with the highest gain is not necessarily the best antenna due to it's high noise figure! Highly interesting for EME enthusiasts are the G/T listings by VE7BQH, a well known DXer. He has calculated and lists all known G/T values of many manufacturers of VHF/UHF yagi antennas. To compensate for the weakening of the elements due to the hole, each element is reinforced with a stainless steel shell. The boom joints are made as high precision laser-cut sheet metal with lowest tolerances. The booms are machined with very low tolerances on a CNC machine. All u-bolts, brackets, nuts and bolts are made from stainless steel, all nuts are self-locking. All other parts are also made from stainless steel or aluminium. The larger antennas with strut contain no galvanized parts at all, with the smaller antennas only the mast clamp is made from galvanized steel, all other parts are stainless steel or aluminium. 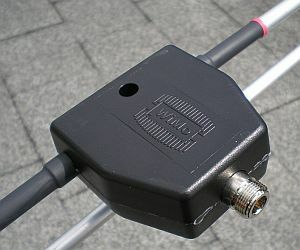 The radiators are folded type dipoles with a teflon cable balun, N female connector. The dipole box is cold welded and foam sealed for protection against humidity. The balun is made from 6mm teflon cable and is completely enclosed in the dipole box.